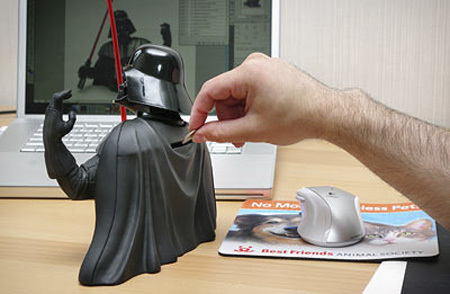 Collection of unusual and creative modern piggy banks that will allow you to save money in style. Cool piggy bank inspired by the Super Mario Bros. video games. 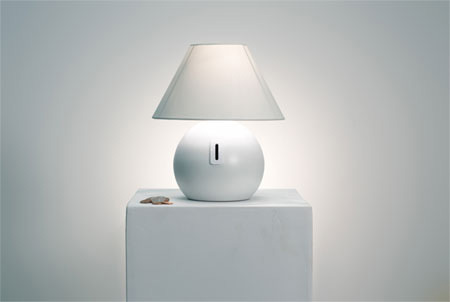 This creative lamp is turned on by a coin-operated switch. The only way to turn off the alarm is by inserting money! 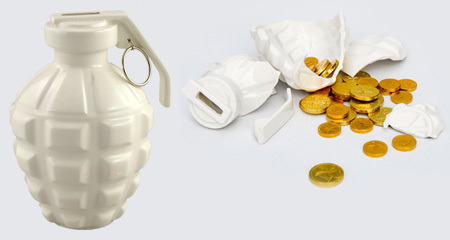 Grenade shaped coin bank by Taiwanese designers Owen and Cloud. Put a few coins aside for a rainy day and watch the gauge inch its way upward. 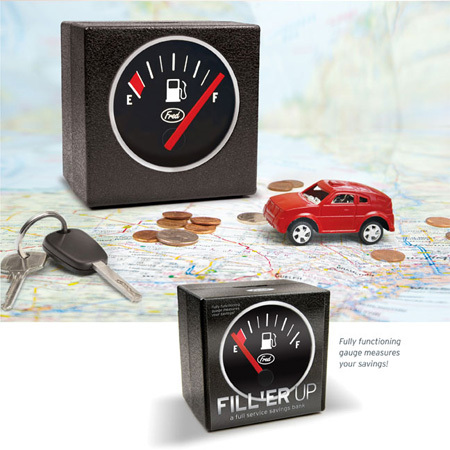 Before you know it, you’ll have a full tank! 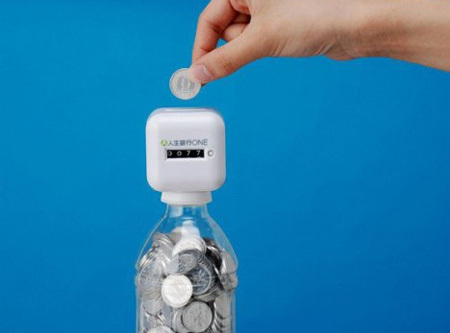 Screw it on to the top of any bottle and watch the counter increase as you save. Sadly, it only counts 1 yen coins. 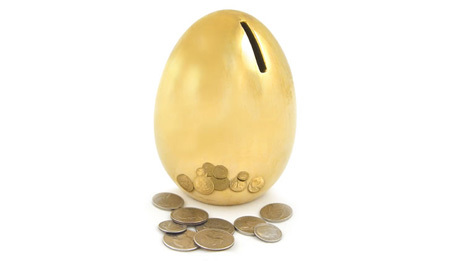 Porcelain money bank inspired by the fable of the Goose with the Golden Egg by Aesop. 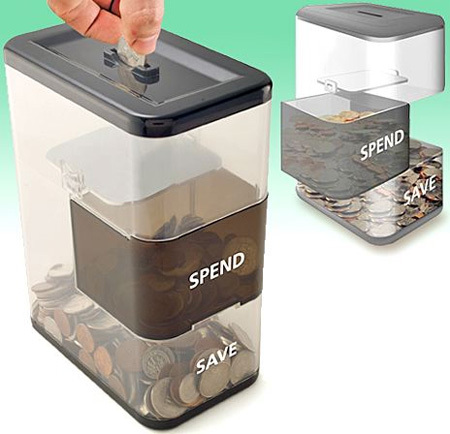 The unpredictable pivoting tray collects, deflects, and randomly deposits coins in either the “save” or “spend” section. It’s a win, win! 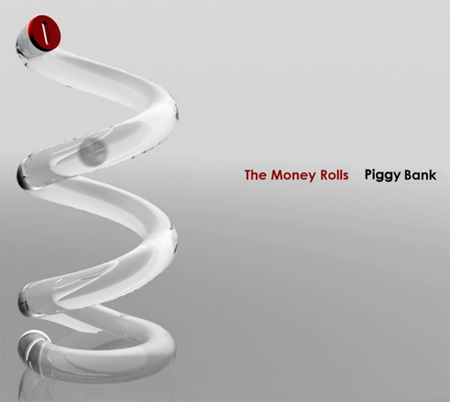 Let the money roll into your piggy bank. It is more fun. 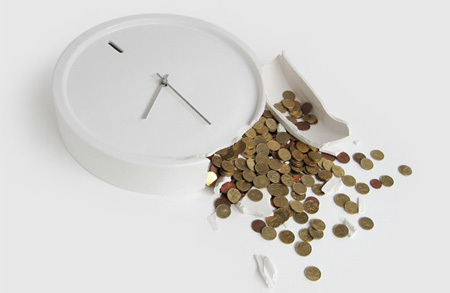 Unusual clock saves your money and shows you current time. 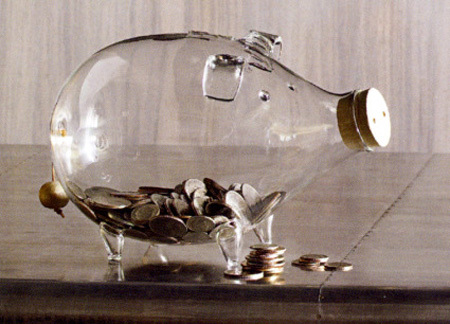 Creative face shaped piggy bank eats and saves your coins. Add coins at your own risk: the money can only be retrieved by smashing the glass. 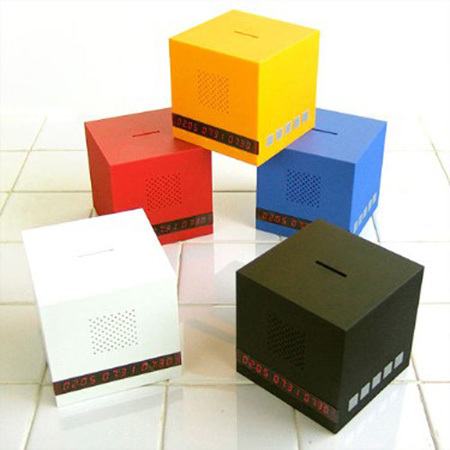 This cool glass bank features a coin deposit slot on the top and a removable wooden snout for easy money withdrawal. I love the glass piggy!!!! 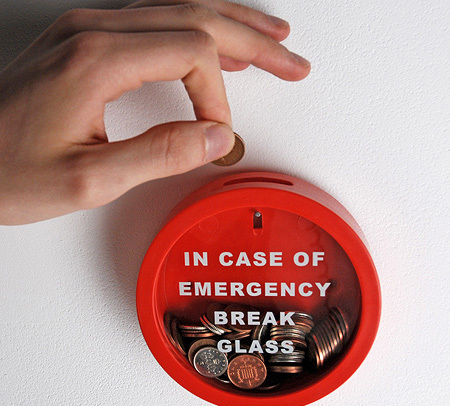 Emergency money box, speaks for itself. Pretty cool. What about the little yellow dude that when you place the coin in his hand he lifts it to his mouth and swallows? Just something I rembered from childhood. Anyone with me on this one? The emergency money box is clever. The rescission piggy is genius and hilarious. Glass piggy is prob. my fav. The same old simple concept, with a “clear” spin. wow, all of these are great! I love the emergency money box. So simple, and I like the type. That face that eats your money is creepy, and annoyingly loud… I don’t see anything appealing there! 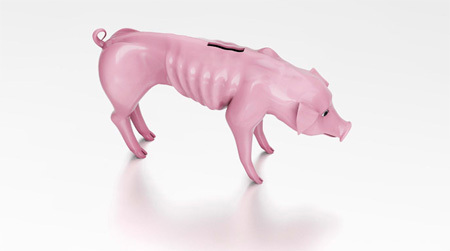 haha… The poor recession piggy bank made me a little sad, but it was clever! Recession Piggy Bank will it become fat when full of coin? these are really some great ideas!!!!! The funniest is the recession pig….and I like the save and spend back!!!! My favorite is the spend/save one, as you get rewarded while you save. The face one looks good but is too loud and slow, I think the novelty would wear off pretty quickly. the face bank is great, but way too noisy!